Nikon has not ruled out the possibility of a more advanced version of its Nikon 1 compact system cameras, to include more manual control. Speaking to TechRadar, Jeremy Gilbert, UK marketing manager for Nikon UK, said, "We are listening and trying to feedback what we hear. It's mostly journalists and high-end photographers who would like us to produce one, but whether we should or not is a different matter." 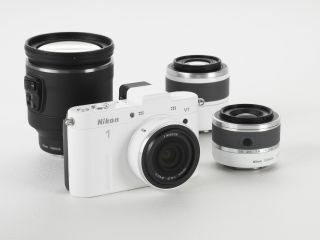 The Nikon 1 V1 and J1 were announced in September 2011, with the J1 going on to become the biggest selling compact system camera. "A pro version would be quite nice," Gilbert said, "But ultimately, we want pros to be buying our DSLRs, so while it would be pretty nice to have within the market, it's so niche that I'm not sure it would help us to be the number one brand." Nikon has admitted in the past that it is still not sure who is buying the J1 and V1, with Gilbert telling us that he was surprised by the number of men buying the camera. "It's more male than I thought, and more SLR owners too - that could be the early adopters though," he said. "We think we're marketing it right, but because it's a system that sits between compact and DSLR, we're finding a lot of DSLR users are buying it as their super-compact camera." It is of course a bit too early to speculate, but perhaps a new Nikon 1 body will make an appearance at the Photokina show in Germany in September. In the pro, or high-end enthusiast area of the market, Nikon would face competition from the Sony NEX-7, Olympus OM-D and Fujifilm X-Pro1.